Background: Iranian Anatomists are experts in different areas of Anatomy and they use different teaching methods. Although there are some cultural and social barriers for cadaver dissection in Iran, it is still a widely used method of teaching Anatomy. Objectives: The purpose of this study is to describe current teaching methods and ideal methods from Anatomists’ point of view. Materials and Methods: We used a questionnaire containing 50 questions about teaching methods and demographic information of Iranian Anatomists. We used Mann- Whitney U test for comparing quantitative and ordinal scale variables and accurate test of Fisher for qualitative variables. Results: Our findings showed that 82% of Iranian Anatomists use lecture and 83.5% of them believe dissection is the best method for teaching Anatomy. According to our study, Anatomists in Iran agree that clinical points and applied contents should be used in comjuction to the above methods. Some Iranian Anatomists have started to change their methods of teaching; however all of them should get familiar with new teaching techniques. Conclusions: Considering the recent advances in medical curriculum it seems that teaching anatomy should be improved by shifting to new methods in teaching and evaluation. Anatomy is an important course in medical education that introduces students to their future careers in cognitive, attitude and psychomotor domains (1). Anatomists in Iran are working in different fields of Gross Anatomy, Histology, Embryology, Neuro-anatomy and Reproductive biology (2). Anatomists who are also familiar with medical education are able to help students to improve their knowledge, attitude and skills. They teach students how to encounter and deal with a cadaver as an alive human and students learn how to respect the cadavers and pay attention to their confidentiality. In other words students encounter the cadaver as their first patient and they should work based on the professionalism (1, 3). A knowledgeable and skillful anatomist should represent a role model for perfect manner to the students (4). Attitude towards curriculum changes varies among Anatomists, so that they can be categorized into two groups: Traditional and Modern Anatomists. Traditional Anatomists try to conserve the content of lessons while modern Anatomists welcome the development of new curriculums, they use new methods of teaching and spend more time on research. In the 1960S, a development in medical education which was formally called Reform was started in North America and Europe and was gradually spread in Asia since 20 years ago (5). The idea of changing curriculums and using new methods of teaching in Iran was aroused after the first medical education congress in 1994. However, the majority of anatomy departments had kept their traditional features and a reform was accomplished only in 14 universities. Moreover, some universities are researching about integration and reform since 5 years ago. In addition, Iranian medical students should get through a National Medical Basic Sciences Exam after finishing the basic science courses in order to enter their next level of education (6). Anatomy courses are important and relatively large part of this exam. As anatomy has a major role in teaching professionalism, anatomists should be prepared for this purpose. Furthermore they should consider using new teaching methods besides traditional ways of teaching. The cultural and social barriers of dissection in Iran and inadequate number of cadavers are two main limitations in teaching practical anatomy, so it seems that Anatomists should make an attempt to find new ways of teaching. Considering cultural influences and variations in the learning process, it is important to find noveland more practical teaching methods (7-9). In the present study we tried to show the current routine teaching methods among Iranian Anatomists in order to promote new teaching methods. In the present cross-sectional study, a Persian questionnaire containing 50 questions in 3 sections was prepared. It included three sections: first section was about demographic information of anatomists, and the second one was about the current teaching methods of anatomy in Iran and the third part was about the ideal teaching methods from Anatomists’ point of view. Questions were planned in three types: binominal, five point likert scale and multiple choices. We assessed validity and reliability of the questionnaire by Anatomists of Tehran University of Medical Sciences. The validity of the questionnaire was confirmed by 15 Anatomists. To re-confirm the reliability of the questionnaire, we tested it on 20 faculty members and obtained Cronbach alpha coefficients was 8.3. In order to maintain the confidentiality of responders, we coded the questionnaires and sent them anonymously to 210 Anatomists. For questions that were planned in Likert scale, the answers were graded from 1 to 5. In some questions, the participant had to rank the items from 1 to 8. We used frequency table and percentage to describe qualitative data and we used Mann-Whitney U test for comparing quantitative or ordinal scale variables. The Fisher exact test was used for interpreting the relation between two qualitative variables. We evaluated the relation between two ordinal scale variables by Spearman correlation coefficient. A value of P < 0.05 was considered significant. One hundred thirty five questionnaires out of 210 were returned (response rate was 66%). It included 106 males (76%) and 33 females (24%). The mean of age was 45 years (28 to 63) and the mean length of teaching experience was 15 years (1 to 32). The results of questionnaires showed that 93 (88%) of the responding anatomists believed that communication skills are necessary for effective teaching and that 64 (46%) of responding anatomists had studied modules of communication skills. One hundred eleven (80%) respondents claimed that even if “National Medical Basic Sciences Exam” did not exist, they would peruse the current curriculum. Nevertheless, only 78 (56%) of them believed the current content of anatomical courses is appropriate for students. The majority of respondents believed the content of curriculum is acceptable. While 38 (27.3%) of responding anatomists were against the current curriculum and believed that a major part of Anatomical courses is unnecessary or non-practical. 85 (61%) anatomists believed that the teaching hours are not adequate and they need more time in order to answer students’ questions. 128 (92%) of responding anatomists claimed that they have certain educational objectives and 114 (82%) of them explain their objectives to students. Figure 1 shows the answers to the question “How well do you cover the objectives that you have planned at the beginning of semester”. This study showed that 77 (55%) respondents ask from the students their ‘opinion about the quality of classes at the end of the semester and that 29 (21%) of them agree the students should participate in choosing the appropriate teaching method. 126 (91%) of responding anatomists declared that they use clinical and applied anatomy and 77 (61%) of them use these items in students’ evaluation. Table 1 shows Anatomists’ satisfaction of their students’ learning, the importance of lessons from students’ point of view and Anatomists’ need to know other branches of medical sciences. 89 (64%) of respondents had participated in medical education workshops. Based on Mann-Whitney U test, there was not a significant difference between the Anatomists who had attended Medical education workshops and the ones who had not. Table 2 shows current and preferred teaching methods in theoretical and practical classes according to the responding Anatomist’s point of view. Our findings showed that 51 (37%) of responding Anatomists use more than one technique for teaching and that 60 (43%) of them preferred to use more than one teaching method. 121 (87%) of respondents claimed that if there were not any financial and time limits, they would change their teaching method. The majority of participants called “dissection” as the best choice for teaching Anatomy (Table 2) and 119 (85.6%) of respondents named power point slides as the most important tool in teaching. Mann-Whitney U test results showed that the ones, who do not use lecture as their first option, were more satisfied with their students’ performance in evaluation (P = 0.03) and that, the ones who use prosection, believed they reach their objectives better than those who do not (P = 0.04). In reply to the question “choose the best method for teaching spinal nerves to 60 students just in 25 minutes”, 17 (12.2%) of respondents chose problem solving method, 104 (75%) chose lecture and 7 (5%) chose role modeling, while 11 (7.8%) of them did not answer at all. Based on Fisher exact test, there was no significant difference in choosing teaching methods between the ones who had participated in Medical education workshops and those who had not. natomy teaching methods differ considerably between different national and international universities (4, 10-12). Despite these differences in teaching methods, there is a lack of consensus about the most efficient method (13). According to this research, 82% of Anatomists in Iran use lecture for teaching and only 3% of them use interactive media. This finding confirms the idea “although we are living in 21st century, our classes are like 1900 ones” (14). However, the majority of Anatomists in Iran believe that teaching methods should be changed. Hopefully, this opinion conforms to Drake’s approaches in 2002 (15). Our findings are very similar to a previous study in UK claiming that 69% of Anatomists give dissection the highest ranking (13). Older et al. believe that dissection should be the method of choice and the most efficient one in teaching anatomy which should follow the student-cadaver-patient role model (10). In medical school of Peninsula, cadaver is not used at all and anatomists use anatomical models, medical images such as MRI, CT scan and living anatomy to teach anatomy (4). Iranian Anatomists believe dissection is necessary for students and it improves their professional style. Nevertheless, from modern medical point of view, dissection is necessary but not enough and should be accompanied by other methods such as anatomical models, educational videos, interactive media and plastination; this idea is also confirmed by some studies in other countries (4). Winkelmann et al. claimed that true dissection is better than prosection and Jimenez et al. also confirmed that dissection is the first exposure of students to human body that leads to better understanding and learning of Anatomy (16, 17). Additionally, the majority of Anatomists prefer to use more than one teaching method (18, 19). Our findings also showed the same willingness among the Anatomists involved in this study; they use three methods at least, while Patel and Moxham showed 18% of anatomists use six methods in each semester (13). 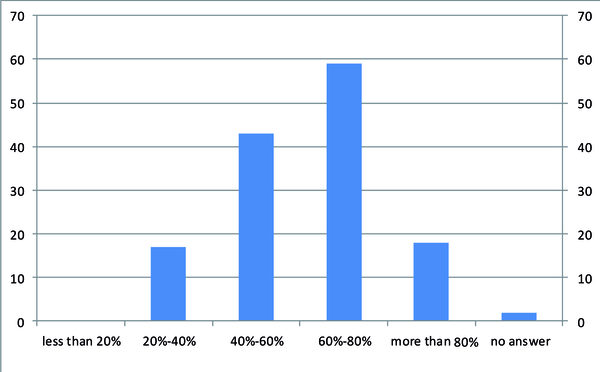 69% of responding anatomists were unwilling to use students’ opinion in choosing the appropriate teaching method; this finding simply may mean that there is need for the changing Iranian anatomists’ attitude towards teaching methods. It is shown that understanding, learning and recalling anatomical knowledge will be easier and more interesting if accompanied by the clinical and applied pearls (20). According to the results of this study, anatomists in Iran also believe that applied and clinical contents should be added to the teaching of anatomy so anatomists ought to have enough and acceptable knowledge in the relevant clinical applications of anatomy. There is a general concern that decreasing the hours of Anatomy courses affects the attitude of anatomists to the quality of their teaching. It is reported by some investigators that young physicians especially surgeons are not satisfied with the way anatomy is taught including hours allocated for teaching, the content and also the method of teaching (12, 15, 21, 22). Despite the limitation of time for teaching there is high volume to teach and around 80% of respondents of this study declared that even if there were not any national exam, they would teach the full same volume of anatomy and only 56% of them were satisfied with the current content. As anatomy plays an important role in medical education it is needed to teach as flexible as possible and it should be clinically relevant (23). So it seems necessary to re-organize the structure of anatomy departments, modify educational objectives and plan new elective courses (24-26). Fortunately, according to this study the general attitude towards improving teaching methods is positive and some Iranian anatomists have already started changing their teaching method and are using new methods without ignoring the role and importance of cadaver dissection. So as the Anatomists are willing to change their teaching methods and use novel methods, it is necessary for educational authorities to assess these changes. 1. Vice-chacellor for research of Tehran University of medical sciences. 2. Educational development office (EDO) of Tehran University of medical sciences, Dr. Mirzazadeh. Implication for health policy/practice/research/medical education: In this study; traditional and modern methods of teaching anatomy were discussed. The purpose was to compare these methods and their efficacy in medical education. This article is implicated for Anatomy teachers and educational staff of Medical universities.